On Christmas Eve, singers with the Lyric Opera of Kansas City's Veterans Chorus gathered at the Liberty Memorial to mark the centennial of the Christmas truce of 1914. They sang 'Silent Night' in three languages. In 1914, at the outbreak of World War I, many artists put their art-making on hold, leaving their studios for the battlefield. Some in the United States waited for years for their country to enter the conflict, and others forged a new path in neutral Switzerland. It was a time of radical approaches in music, visual arts and literature. And now, local arts organizations are marking the centennial of the Great War. Kansas City Symphony music director Michael Stern calls the years leading up to World War I "a perfect storm." There was the shock of the new – a shift from horses to cars, from gas to electric light, from agriculture to industry. "So by the time we get to 1914 and the world explodes, if people had been listening and watching, especially listening to music, you could have forseen this kind of incredible shift," he says. This moment, especially before the war, was fascinating for Stern. The Symphony's classical season is organized around this theme with composers like Maurice Ravel, Jean Sibelius, Claude Debussy and Igor Stravinsky. On Thursday, Stern led a morning rehearsal at Helzberg Hall, with the Symphony packed on stage and additional musicians in, to perform Stravinsky's The Rite of Spring. "This piece is as elemental and hits you in the gut, just as it must have the first time it was played," he says. "Of course, the savagery, which was also a reflection of what the world was about to turn into, was all there," says Stern. "But there’s also this kind of lurking, searching, unfulfilled human expectation, which was the unrest at the time." It’s not often there’s music piped into the galleries at the Nelson-Atkins Museum of Art, but it’s part of the exhibition, World War I and the Rise of Modernism. "The (National) World War I Museum is telling the big socio-political story, and the personal story of those who served, and those who were wounded, and those who died and those who were survivors," says modern and contemporary art curator Jan Schall. "We’re telling the arts story." It's a story that reflects the rapid changes before World War I, the service of artists in the military and the new artistic directions after the war. Wassily Kandinsky, Russian, 1866-1944. Rose with Gray, 1924. Oil on pulpboard. 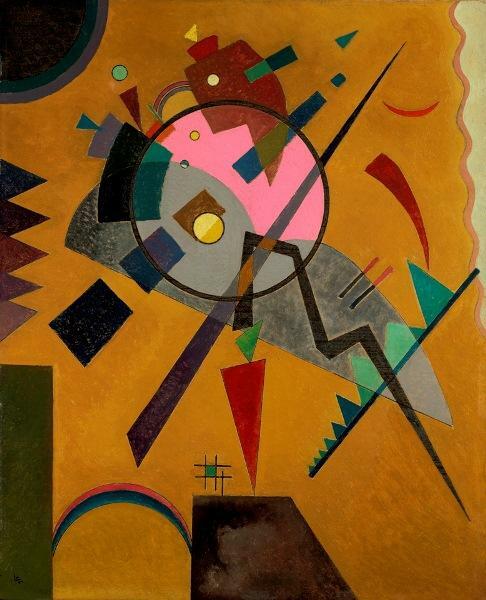 In the exhibition, there are two paintings by Russian artist Wassily Kandinsky; one is on loan from the Solomon R. Guggenheim Museum, the other is in the Nelson-Atkins collection. In Munich in 1911, Kandinsky formed a group called Der Blaue Reiter (The Blue Rider) with artists such as Franz Marc. A Kandinsky painting of a rider wearing blue on an abstracted horse faces a work by American artist Marsden Hartley. Like Kandinsky, Hartley left Germany and returned home during the war. "His (Hartley's) painting is about the trauma of the war exploding in the midst of everyday life," says Schall. "It was painted in 1915-1916, so it’s really about the shattering of the order in culture." There were artists who served their countries, and friends on opposing sides. Georges Braque fought for France. Franz Marc died for Germany. Austrian artist Egon Schiele survived military service, but died of the Spanish flu. "There are those stories and then there’s Monet in the midst of it all," says Schall. French impressionist Claude Monet painted his meditative Water Lilies series in Giverny between 1915 and 1926. And one painting in the series is on display at the Nelson-Atkins. According to Schall, at the closest point, the battle lines on the Western Front would have been about 60 miles away. With a son and stepson in the war, Monet could have heard sounds of battle, the echoes of the bombs. On Christmas Eve morning last year, it was chilly and windy. The Lyric Opera of Kansas City's Veterans Chorus gathered at the Liberty Memorial to mark the 100th anniversary of the Christmas truce of 1914. It was a brief period of time when fighting stopped along sections of the Western Front in Europe. Soldiers exchanged gifts and sang carols. "For me, it’s very meaningful when I sing those same carols to think that these carols were sung there on that day. Of course, the tragedy is that it was all put away and the next day they went back to fighting," says Matt Naylor, executive director and CEO of the National World War I Museum. "We have a responsibility to learn and make meaning from the Great War and to commemorate and remember," he says. National World War I Museum president and CEO Matt Naylor shows his grandfather's shaving kit from the Great War. For Naylor, it's not only a professional mission, but a personal one. He unrolled a shaving kit, his grandfather's from World War I. There’s a white bone handle on the blade, and Naylor says if you look closely, it’s made in Germany, but issued by the British. Before the war, he says, they were great trading partners. "The world got swept into the first global conflict in a very short period of time," says Naylor. "So it tells us something about the fragility of international relationships." Naylor says forging relationships with other local institutions, and finding points of intersection, will help connect more people to these stories — stories that continue to resonate 100 years later. Nelson-Atkins Museum of Art, World War I and the Rise of Modernism through July 19; American Soldier, Jan. 23 through June 21. Kansas City Symphony, Stravinsky's The Rite of Spring, Debussy's Prelude to the Afternoon of a Faun, and Brahms' Piano Concerto No. 2, Jan. 9 - 11. Kansas City Repertory Theatre, An Iliad, Jan. 23 - Feb. 15. Friends of Chamber Music, Forte Film Series, Paths of Glory, Jan. 22; Ariel String Quartet, discussion and performance on Jan. 28 at the National World War I Museum, and concert on Jan. 30 at the Folly Theater. Lyric Opera of Kansas City, Silent Night: An Opera in Two Acts, Feb. 20-21. National World War I Museum, ongoing programming, including a passport program highlighting area organizations or landmarks with ties to World War I.